I still remember walking into my oldest son’s bedroom when he was little and seeing his dinosaur hanging from the window blind cord. His little 4-year-old fingers had wrapped the cord around Mr. Plastic Dino’s neck and his pudgy plastic body and short legs swung to and fro along the window frame. Even though I knew it was his toy, a mental picture of him in place of the dinosaur flashed through my mind. Anxiety kicked and I made him promise me right then and there he wouldn’t play around the windows anymore. I stressed the importance of not playing with the cords on window coverings but the anxiety was already there. A few months later I took a job in the drapery department of a local retail store. I quickly learned about cordless cellular shades and how they can be safer because they have no cords. 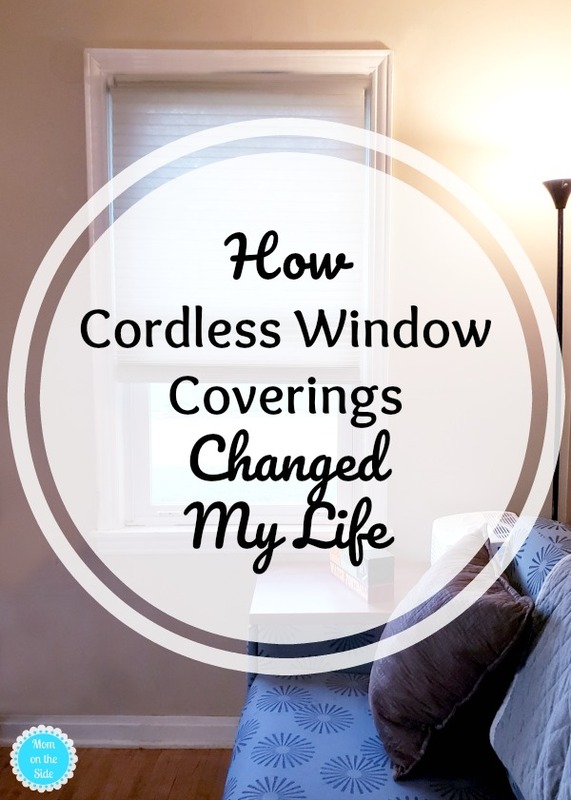 Since then we’ve been changing out all the window coverings in our home to cordless window coverings and it has changed my life. 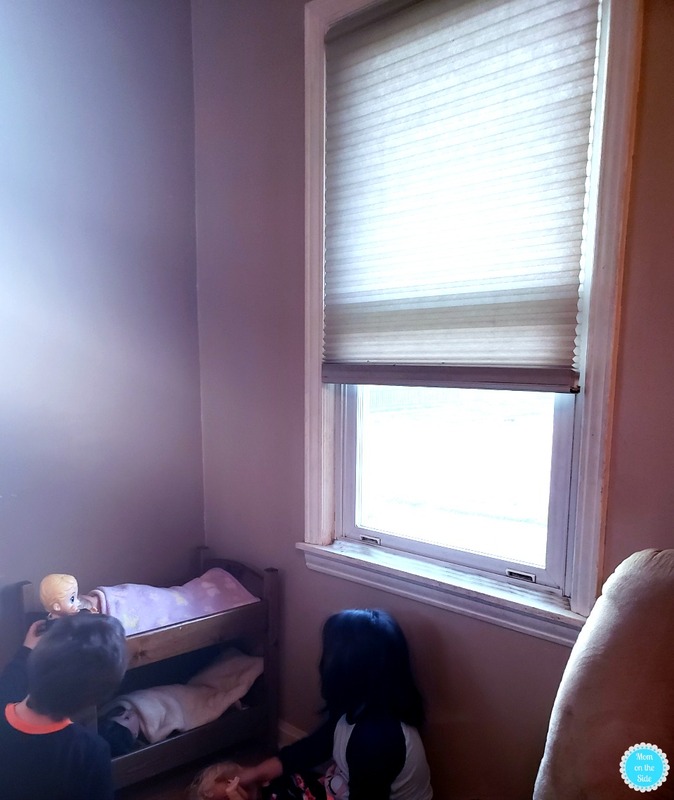 As a mother with four kids, having window coverings without cords gives me one less thing to constantly worry about in a world that already gives us so much to keep an eye on when you have children. Exposed or dangling cords can pose a strangulation hazard to infants and young children and removing them from the windows removes the worry from my mind. When my oldest daughter was little (she turned 17 last week! ), we had old fashion mini blinds. We were constantly replacing them because she would break the slats or mess up the cords when she would look out the window. 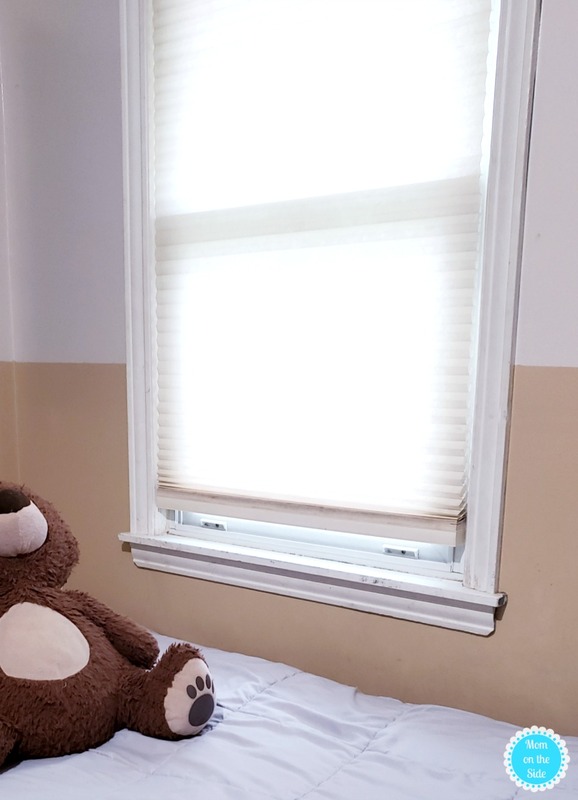 With cordless window coverings, kids can easily push them up and down to look out the window. In 6 years I haven’t had to replace a single cordless cellular shade in our house yet. Tip: Clean cordless cellular shades of dust using air in can and spraying inside the honeycombs. A lint roller works great to remove dust on the outside layer. It’s not just my kids who can play safer around windows with cordless shades, our cats can too! 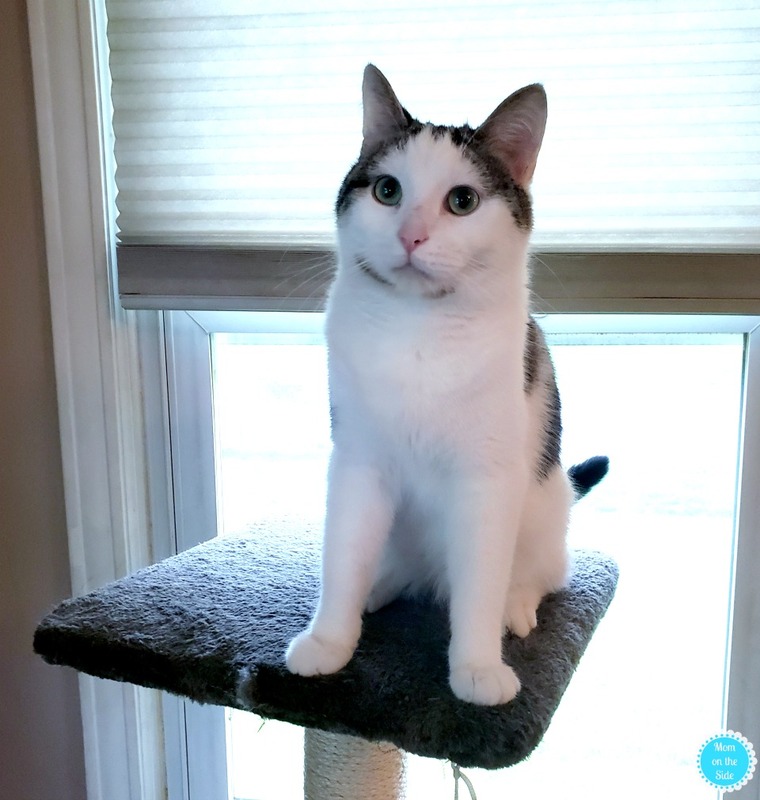 Five loves hanging out on the cat tower which we keep by the window so he can look outside or nap in the sun. No cords for him to bat around and he surprisingly doesn’t claw up the cordless cellular shades so it’s a win-win! I can also put the beds near any window without worry thanks to cordless window coverings. 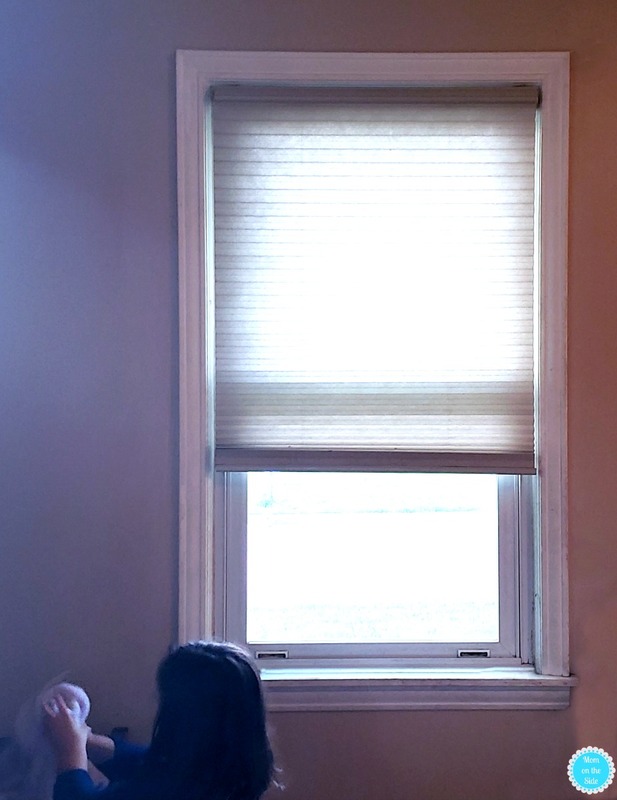 My teen daughter loves having her bed against the window so she can read her books in the sunlight. Without cords she can easily lift and lower the shade from her bed. Another life-changing thing about cordless window coverings for me is that I don’t have to use curtains! Cordless window coverings come in a variety of styles, fabrics, colors, and designs. They look great hanging in the window without any valances or panels and block light well so the extra layer isn’t needed. Not only does it save me money but I don’t have to mess with cleaning them when I don’t have them! 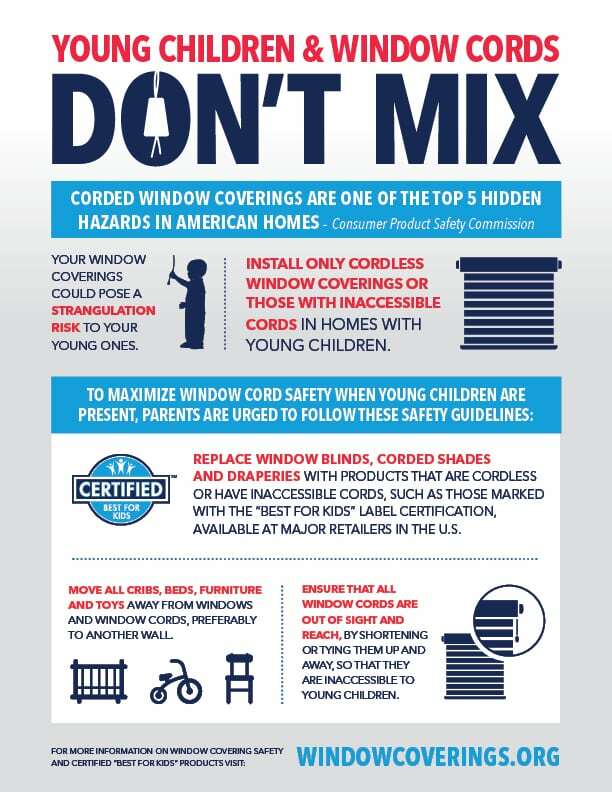 October is National Window Covering Safety Month making it a great time to replace any corded window coverings with cordless products. Especially those windows children can reach and are around often. It’s a simple swap to make especially if you are already refreshing a room in your home. To help you make the right choice when selecting window coverings, you can easily identify cordless options by the Best for Kids™ certification program. You’ll find them at major retailers across the country making it easy to make the switch!